I've been backpacking for 45 years and regularly in the Rockies since 1986. I do at least one week-long trip every summer, and often take three-day trips. I'm usually camping in alpine terrain, at altitudes 5000 to 10000 ft (1500 - 3000 m). I prefer base camp backpacking, a long hike in with day trips from camp, but I do forced marches too. Recently I've been actively reducing my pack weight, though I still often include my favorite camp conveniences and always bring a floored tent. Lately I’ve discovered a great new backcountry activity - packrafting. The Graphic Storage Bag is a storage bag with a dry-bag style top, which rolls up and is then clipped together with a Fas-Tec buckle. The Graphic in its name comes from the pattern on the outside of the bag. Mine is entitled “Clouds” in a color called “Bluejay.” As may be seen in the photograph below, that pattern is quite different from that displayed on the manufacturer’s website for this choice. Outdoor Research offers a number of alternatives patterns and background colors, which vary depending on the size of the Dry Sack. Outdoor Research markets the Dry Sack as a stuff sack for water-sensitive items that may be stashed inside the user’s backpack. Warranty: The Dry Sack is subject to OR's Infinite Guarantee. Apart from its cheerful graphic the Sack looks and functions much as any other dry sack. Stuff the desired contents into the sack, squeeze out any remaining air, place the top edges together, roll the merged edges down, and snap the buckle into place. OR recommends at least three rolls to ensure a secure seal, a direction that if complied with will set the Sack’s capacity. Note that, again consistent with my experience with other dry sacks and bags, the Dry Sack has no compression feature. I’m dependent upon manual power for stuffing items inside. I will say that the Dry Sack feels appreciably lighter than other dry bags I've used. A nice detail is a small D-ring immediately adjacent to the female end of the buckle. This should be particularly useful should I store the Dry Sack outside my pack in my packraft. Here’s a photo of the Sack with my Nunatak Ghost down sleeping quilt, Montbell EX Lite Down Jacket, two pairs of heavy socks, and a pair of lightweight merino wool long johns stuffed inside. (You may check my reviews of the first two of these items on this site for dimensions.) As it’s usually these items that I want to be sure stay dry while hiking on a weekend trip, it appears that the 15 liter size will be very useful for me. OR notes on the package that housed the Sack that this size is suitable for a down sleeping bag or lightweight two-person tent. To test this I also stuffed the Sack with my largest sleeping bag, a 5 F (-15 C) semi-rectangular Western Mountaineering down bag, and (separately) the body of my Stephenson’s Warmlite 2R tent (also reviewed, should you wish to check dimensions), each time without a problem. I like the bright colors of the Sack, which should facilitate picking it out of my pack or tent. Workmanship, in particular the stitching of the bag to the top strips of material, appears faultless. Only one negative to report at this point: no doubt to save weight, the Dry Sack has no handle or other grip on the bottom, making it a bit more difficult to empty the contents. 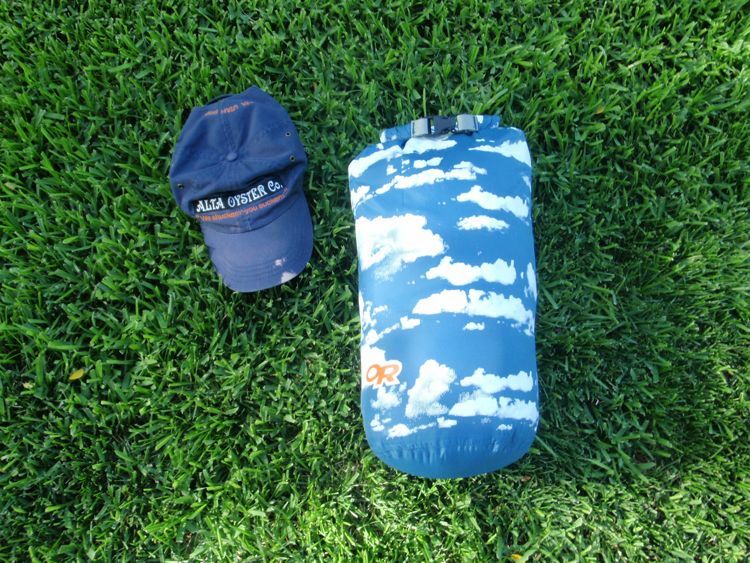 The true tests of any dry bag though will be durability and how well the Dry Sack repels moisture in the field. A one-week holiday to Big Timber, Montana in mid-July. On this trip I stayed at a rented house and took several day hikes and all-day fishing excursions. On the day hikes I used the Bag to store a mid-layer down sweater, lightweight rain pants, and a spare rain shell (in case one of the teenagers on the trip forgot to pack hers). We had four warm, sunny days, with the temperature about 85 F (29 C), and an overcast day in Yellowstone Park, when the high was about 60 F (16 C). A one-week service trip on the Shoshone Lake trail in Yellowstone National Park, Wyoming in mid-August. This was a base camp trip, with a 7.5 mi/12 km hike to camp and daily hikes to the work site. On the hikes in and out I stuffed the Sack with my Nunatak Back Country Blanket (an oversized down quilt), a midlayer down sweater, and one pair of socks. Both hikes were dry, in sunny weather with daytime high temperatures at about 80 F (26 C) on the way in and 90 F (32 C) on the way out. On both hikes the Sack was at the bottom of my pack. A five-day llama-supported trek into the Bechler Meadows of Yellowstone National Park, Idaho and Wyoming, in the last week of August. While the llamas carried my tent, again the Sack was at the bottom of my pack (a daypack-overnight pack hybrid), stuffed with the Back Country Blanket and an oversized Nunatak Skaha Plus Sweater. These two items pushed the Sack’s capacity to its limit, as when I arrived at our first campsite I noticed that the rolled top of the sack had unwound somewhat, exposing a small corner of my down sweater. Weather was overcast with rain squalls and the occasional hail attack on the hike in, and a sunny and bright 85 F (29 C) on the hike out. A five-day trip to Bozeman, Montana in late September that combined day hikes, fly fishing, a job interview, and house hunting. I stowed my rain gear and a sweater in the Sack, which in turn was kept in my pack on my day hike or in my duffel bag when hiking or fishing. Indian summer weather on this trip – highs about 80 F (25 C) and nighttime lows about freezing, with no rain or other precipitation. Though we were based in Bozeman on this trip, a friend invited us to visit his ranch about eighty miles away, and my friend and I stayed overnight there. I took a change of clothes in the Sack. Throughout all these adventures the Sack has done its job as it should. I have yet to find a drop of moisture inside the Sack or on its contents. And on the hike out from the Shoshone Lake service trip the Sack received a test that, had I tried, I doubt I could have staged any better. After making our water crossing at Lewis Channel, about ninety minutes into the hike, the hiker behind me noticed water dripping from the bottom of my pack. I discovered a small rip at the top of my water bladder and only a small amount of water remaining in the container. The water bladder sleeve is at the top of my pack, and when I reached the trailhead a couple of hours later I found that everything in my pack was damp or sodden - except for the contents of the Sack, which had remained bone-dry. Very well done! Except for the minor unwinding on the Bechler trip – which did not expose any of the down – the Sack’s dry bag closure has functioned properly and without any incident. I’ve found that it helps closure (and reduces the size of the stuffed Sack) to press out excess air before rolling up the top and closing with the buckle. Excess air can force the rolled-up top and makes it more difficult to grip. As usual, it helps to follow the manufacturer’s directions. I like the Sack’s size. So far it’s sufficed to enclose my down items (albeit only barely on the Bechler trip), the gear I really need to keep dry. 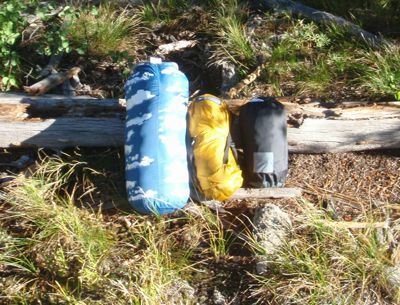 Here’s a photo of the Sack, with bag and sweater, next to a smaller stuff sack and rolled-up down sleeping pad. It’s a nice size for placing it inside my pack. At full capacity it still fit (with a bit of stuffing) across the bottom of the hybrid pack (46 L / 2800 cu in capacity) used on the Bechler trip, and without forcing it fits neatly across the bottom of my regular base camp pack, a ULA Catalyst (reviewed on this site). One of the smaller available sizes would be a better fit for the back panel pocket of my fishing vest. I’ve found a regular second job for the Sack. When stuffed with spare clothing, indeed any clothing not in use at the time, and cinched up it’s just the right size for a pillow. If I have to use anything damp as stuffing, I simply turn the Sack inside out in the morning, and it dries very quickly. The bright graphics definitely stand out and really do make the Sack easy to find inside my tent or pack, either in daylight or at night using my headlamp. The omission of a half flap or other grip on the closed end, noted in my Initial Report, has proven to be the Sack’s one shortcoming. It has been difficult to grab the Sack when extracting my compressed down bag upon setting up camp, making this task more tedious than it should be. I just can’t grasp the closed end with one hand. Even a thumb-sized loop would help considerably. I’ve used the Outdoor Research Graphic Dry Sack on three backpacking trips and numerous day hikes, and also on a business trip. I took two overnighters in the Texas Hill Country, at relatively low elevation (about 1500 ft/460 m maximum), during typical fall weather – daytime highs from 70-80 F (21-27 C) and early morning lows down to 40 F (4 C), with no precipitation but plenty of morning dew. A three-day, two-night trip was colder, near freezing at night and not above 60 F (16 C) at any time. On these trips I used the Sack to stash my sleeping quilt (Nunatak Ghost, reviewed on this site) and midlayer down sweater, with a spare pair of socks added on the longer trip. My day hikes near Dallas were mostly in the early morning, with temperatures from 35-55 F (2-13 C). Our autumn rain has been concentrated into a few heavy storms, conveniently occurring on weekdays and thus not coinciding with any of my hiking. I used the Sack for a merino sweater and spare pair of socks. The Sack was thus less than half full, yet worked as easily and comfortably as when stuffed to its brim. I simply rolled the Sack’s mated lips down to the contents, squeezed out excess air, and clipped it up. At this size the Sack fit nicely at the bottom of a lightweight daypack that I’ve been using. Last week I did another day hike along the Wheeler Peak trail near Taos Ski Valley, New Mexico, climbing about 2400 feet (730 m) from a trailhead elevation of 10020 ft (3054 m) until our route to the summit was blocked by snow, on a calm, sunny day at temperatures from 22-40 F (-6 to 4 C). I used the Sack for a heavy down sweater and a set of merino underwear (long-sleeved top and long johns). The business trip was a one-week journey to two European cities. I started the trip with the Sack empty, but added dirty laundry as the trip progressed. Not much new to report beyond my commentary in the Field Report above. The Sack is easy to use, has kept its contents completely dry, and remains intact. I’ve found that the fabric resists soiling, as I haven’t found it necessary even to spot-wash it. After the business trip I consciously left the Sack to air out in the sun, turned inside out, just in case it had accumulated any odors (I hadn’t detected any) from soiled clothes. Note that I have not used the Sack for any food, partly to keep from having to clean it and partly because I like to use it, properly stuffed, as my backcountry pillow. If it smelled of food I’d have to suffer retained odors through the night, even if I wasn’t in bear country where I’d have to hang anything smelling of food. Pillow use, and use as a down-filled base at the bottom of my pack (and therefore the small of my back) when hiking are two bonus features of the 15L Sack. Though on occasion it’s taken some extra cramming, once in awhile moving some of the contents elsewhere, I’ve always been able to fit the stuffed Sack across the bottom of my pack (in fact, four different packs, all different sizes). Durability has been excellent; the Sack looks as good as new. The top closure and buckle have performed as they should without fail, though it remains important to expel any excess air before closing. As noted, no cleaning has been required beyond a couple of hours in the sun. The eye-catching graphics are not a marketing gimmick. They make the Sack easy to spot anywhere, particularly in the dark inside a tent. Lightweight, works as advertised, cheery, durable, and capable of a very practical second job as a pillow - all in all, a first-rate product, in my never-humble opinion. As before my only criticism is lack of a grab loop on the bottom. C'mon, add a few grams and make this thing well-nigh perfect! I’ve set my next summer’s backcountry objectives on increased packrafting. This Sack, and maybe a couple of its differently sized cousins, will be in my pack for sure if this comes to pass. My test report ends here, with sincere thanks to Outdoor Research and BackpackGearTest.org for this testing opportunity.